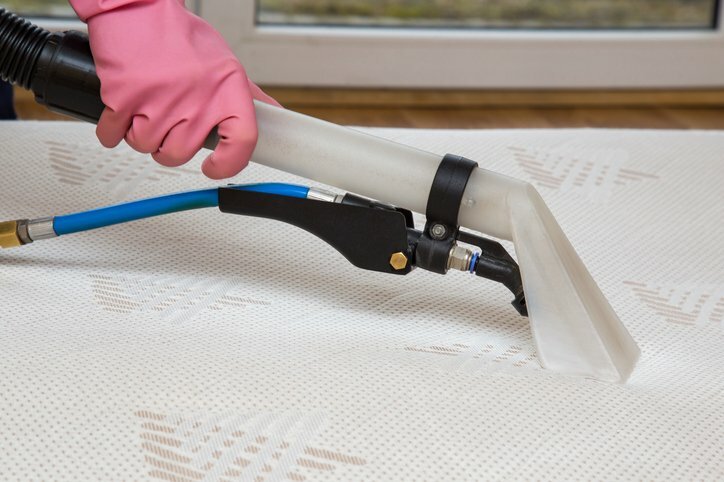 Removing stains from a pillow top mattress is a challenge many people are afraid to face. Pillow tops, in particular, are susceptible to stains thanks to the ultra-absorbent power of the top layer. If your mattress has become stained over time, there are a few ways you can restore it to its original state. With the help of a quality furniture shampoo and a few other household items you can make your mattress as good as new. The best way to keep stains from sinking deep into your mattress is to react quickly when there has been a spill. Use a towel or rag to quickly soak up as much of the liquid as possible from the top layers of the mattress. Professional cleaners recommend using a cool damp cloth to soak up the spill, and then using a dry cloth to soak up any remaining liquid. Press down on the stain to absorb the spill instead of wiping it, as this will only spread the stain. You can buy commercially available furniture shampoos, or you can make one on your own. A small amount of baking soda and water mixed together to form a paste with a pinch of salt is usually effective for treating stains. Just mix it up and then spread the paste on the stain. Try not to make your paste too wet as your pillow top mattress will absorb the extra liquid. Using a soft bristle brush, gently work the shampoo or cleaning solution into the fabric. Work slowly and deliberately in a circular motion. Follow the directions on your shampoo for removal, or let the solution sit for five minutes. Check it again to see if the stain has lifted. You may leave the solution on for up to 30 minutes. By using another cool damp cloth, you can press down on the area to remove the shampoo or baking soda mixture. Try to absorb as much of the remaining liquid as possible. Then use a clean dry cloth to wipe away any excess residue left behind. Most shampoos and baking soda act to prevent unwanted odors, but we recommend putting a fan on the area to dry it out faster. When it comes to mattresses, MATTRESS360 knows them better than anyone. Visit us in our Glendale mattress store or online to learn more about mattress care. If you are looking to buy a new mattress, we are ready to help with our great financing options.